After the successful launch of the UK based BBC iPlayer, the corporation has today announced that it has launched an international BBC Worldwide MySpace TV channel at http://www.myspace.com/bbcworldwide. 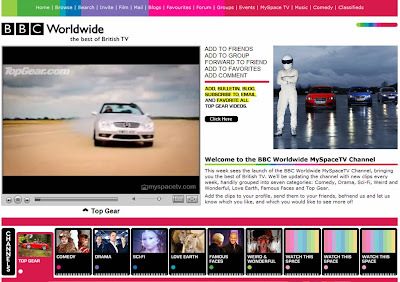 The BBC Worldwide MySpaceTV Channel aims to showcase "the best of British TV." Clips won't just be from Top Gear or Doctor Who, they will be taken from a range of genres including "Comedy, Drama, Sci-Fi, Weird and Wonderful, Love Earth, Famous Faces - and Top Gear."